Im back after a long hiatus and I just bought the Montage 8. Still have my XS though. Shouldn’t there be a Montage forum here at the Motifator.com? Have I missed something? it is more than a year old already. Thanks for the reply. Now I know why. I still own the XS8 so I will be coming back here anyways. And from that perspective there is a legitimate intersection between Motif and Montage that would be fair game to be covered on Motifator. Maybe not a forum dedicated to Montage, but certainly a forum dedicated to the interfacing Motif and Montage. It is very likely that many Motif/Mox/Moxf owners will add a Montage to their rigs at some point in the future and so how to get the most out of combining them, or questions about compatibility, or questions about cross pollination between the two could be in the balliwick of Motifator. I for one would not want to see Motifator turn into a Montage love fest, but there are some obvious overlaps between the two keyboards that could be addressed here to the benefit of Motif owners. Lastmonk, you’re absolutely right in terms of the overlap but for us to proactively involve Montage is the site we’d need to know the product to the same degree as we know Motif series. Currently we don’t, and Yamaha’s energies are now focused on their own internal platforms. We hope people continue to use the lounge as a town square for Motif-to-Montage discussion but unless Yamaha has a significant change of heart in how they want to relate to or support third party web resources - and specifically Motifator! - I can’t see the present situation changing. Fair enough. And I for one appreciate the extremely high quality know how and expertise and insight that I find on Motifator. It is second to none. So no I would not want to see a watered down, or poorly supported treatment of the overlap/interface between Motif and Montage. Perhaps, in the future Yamaha may come back to their senses. One thing is certain, without the kind of support and commitment that Motifator gave to the Motif community early on and throughout its tenure, the Montage will likely not see or enjoy the level of success that Motif and Motif Society has enjoyed. I haven’t been to the site in ages and it’s been infinitely longer since I’ve posted but after seeing this thread, I thought I’d give a big thank you to Keyfax. Motifator was an invaluable resource for me for ten plus years beginning with the purchase of my orignal Motif, my ES Rack, and all the way through my XS8. I put a lot of energy into trying to help others in the same manner I received it. Inspired by the great gurus- BradWeber, DavePolich and the imcoparable BadMister. They especially were Godsends. I just saw that Brad passed! sigh… Anyway, the bulk of what I know is due to them and their expertise and the clear and thorough way they explained things. Amen., But as much as I appreciate all the good knowledge and resources and where this site has been, and what it has done, I’m looking forward to where it will go and what it will do in the future. Even though Montage is on the hype stage at the moment, Motif is an institution in its own right. Its not going anywhere for decades. Hell people are still playing S90s and the computer integration and sampling capability of the Motif positions it to hold its own against any contenders and all pretenders. And the MOXF has just opened up the Motif world to a whole lot of fresh meat. Yamaha , has to do what they think they have to do to keep up with and answer Korg and Roland’s flagships and the proverbial grape vine. But the musicians that have purchased MOX/MOXF/Motif they’re the ones that are making the music and pushing the envelop (excuse the pun). Sure Montage has features that Motif does not have, But Motif has features that Montage does not have. Yamaha might be trying to predict / control the future by introducing Montage, but at the end of the day musicians dictate what the future will look like. Who would have guessed that there we be such a resurgence in retro analog synths? Lots of vendors are going back to the future. I hear Dave Smith has some new analog stuff on the drawing board. Motifator is an incredible knowledge base and community for the Motif. But Motif is far more than just a product now. Its a legend LOL. This site is more than just simple product support. And because of Motif’s design, its a vibrant part of future of hardware synths (which will never go away!) . Motif has its fingers in a lot of pies, one in the DAW world, one in the subtractive synthesis world, one in sampling world, all with robust computer integration. The question is where does Motifator want to go? I agree, with Mr. Motif Motifator should not become product support for the Montage without the requisite support from Yamaha, but on the other hand I think it makes sense for Motifator to continue to support Motif players as they integrate their Motifs with current and future software, current and future hardware, and current and future synthesizers. Contrary to some of Yamaha’s marketing tactics, I do not see Montage as a replacement for Motif. At best they’re are complements. While it is true, that most folks don’t have a budget to buy both at one time and will typically have to decide one over the other. The Montage is not a replacement for Motif. It is entirely practical for Motif owners to at some point add a Montage to their gear and for Montage owners to realize they want to add a Motif (given they’re lucky enough to find one). And it will be natural to want to exchange files, transfer knowledge, and midi control between the two as much as is practical and possible. Motifator could definitely play some part with all of that. At the end of the day that brings more value to Motifator not less. A forum dedicate to Montage not necessarily so good and not politically correct here. But something on the integration of Motif with other Synths whether it be Omnisphere , the new wave of analog synths or the Montage, is not necessarily a bad idea. Motif can hold its own, so integration discussion would probably be fruitful for the Motif community. For example I just saw some one sample some crazy Omnisphere 2.0 sounds on the Motif and add them to a Motif track (very nice stuff) The whole operation made me appreciate both Omnisphere and Motif more. There was no temptation to rush out and replace my Motif with Omnisphere :-) One of my mates is getting ready to pull the trigger on a Montage, and I know we’re going to be trying to share and integrate as much as possible (if nothing more than ideas) because we’re in the same band! So to that extent I think Montage is in Motifator’s future, if for no other reason than Motif owners will integrate with Montage in one form or another in future adventures! While I have not earned a livelihood as a musician for many years, I continue to create music (typically jazz) for my own enjoyment. My personal studio integrates an ES8, an XF8 and a bass synth triggered by Roland PK25 bass pedals. Output is routed through a Presonus AR12 to a Windows laptop running Capture 2 and Studio One 3. I am contemplating adding a Montage 8 so I revisited the forum after a four year absence to secure some enlightened perspectives on the product. I was semi-surprised to find no Montage tab on the Motifator site. Keyfax is to be awarded the highest honors for its creativity and support of the Motiforum site. Dr. Phil (helpful beyond price in other than supporting the Yamaha party line) and Yamaha apologists notwithstanding, this is all about $$$! 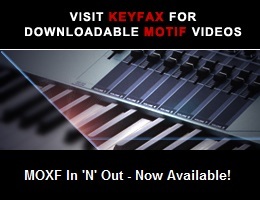 Yamaha erroneously believes it can “go it alone” without contracting Keyfax to integrate a MOntage into the Motifator website resource. Keyfax is to be commended for continuing its hosting. From all I can perceive through online reviews and hands-on product sampling at Guitar Center and Sam Ash, Montage is an extension of the Motif concept, not a new species. Virtually the entire market demographic for Montage purchases exists on this website. Penny wise and pound foolish, Yamaha. P.S. In the absence of Motifator supportive colloquy for the Montage, I am leaning toward a Kronos 88 as a replacement for my ES8. P.P.S. Pulled the trigger on a New Kronos 88 V 3. Guitar Center matched Kraft’s online pricing deal with travel case, Korg nanoPad and no shipping charge + a nice trade-in on my ES8. The local GC estimates a 50/50 Montage/Kronos split in sales. After one unsuccessful week of trying to appreciate the Korg Kronos 2 88 in tandem with my XF 8, a $500 Labor Day Guitar Center price reduction on a Montage 8 was all the additional incentive I needed to return the Kronos for a virtual even swap on a new Montage 8. Looking forward to catch you there. PS, I love Motifator. I really wish you had a Montage section, and as of now it seems like a real void to be filled. Hopefully this message doesn’t violate the forum rules here. Wow. I understand this forum a lot better now. I had no idea. I would like to extend my appreciations to KeyFax and salute those who make this site invaluable.